Beach House 65 at Venus Bay feels like a world away. 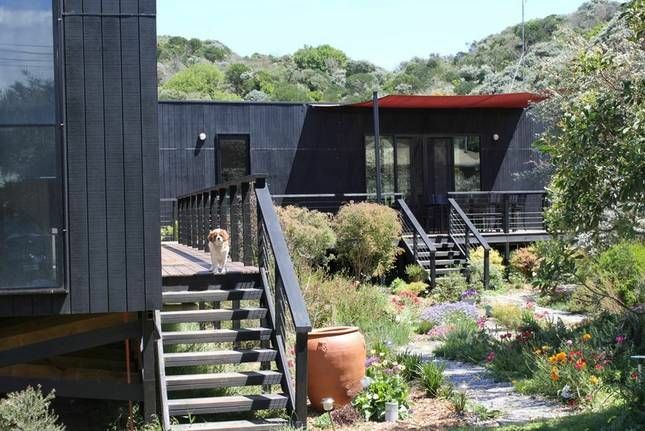 Two separate 'pods' are nestled in a large well kept native garden backing onto coastal sand dunes with direct walking access through the back gate and Cape Liptrap Coastal Park to Venus Bay's main swimming and patrolled surfing beach, Beach 1. The 'sleeping pod' comprises 4 bedrooms, three with a queen size bed (plus a single mattress in one of the queen size bedrooms). The 4th bedroom contains 2 double bunk beds. The sleeping pod also contains 2 bathrooms. A port cot is located in the double bunk bedroom. The sleeping pod is conveniently linked to the 'living pod' by a boardwalk and extensive decking for entertaining and relaxing. Each bedroom also contains a ceiling fan and electric/oil heating and adjoining robes. The property can sleep 10 persons (max 8 Adults) but it ideally suits up to 6 Adults and 4 Children. BYO sheets, pillow cases and towels. The living pod (with separate laundry and toilet) features a well equipped kitchen, granite bench top and four large lounges and a day bed for relaxing and socialising. The living pod is well equipped with TV, CD, DVD and an extensive book collection. The deck adjoining the living pod contains a portable BBQ. Both 'pods' are surrounded by large decks. Each deck has an outdoor setting, as well as an umbrella. There is also an outdoor shower (hot water available) conveniently located near the back door. The property is both child and pet friendly. A kennel is located under the front deck. The property is fully fenced. Beach House 65 in conveniently located close to the Venus Bay shopping village, with general store, cafes, pharmacy, real estate agents and gift shop. The property is also situated in close proximity to many local tourist attractions and amenities - Wilson's Promontory, boating and fishing on Andersons Inlet, several boat ramps, as well as arts and crafts galleries and wineries and walking and cycling tracks. Enjoy the convenience, peace and tranquility of Beach House 65. The house was in a great location and offered privacy and comfort. Plenty of room for all of us and the 2 seperate decks provided ample space for entertaining. A couple of things could bring this house to an even greater rating: a dishwasher, better glassware and cooking equipment to cater for large numbers and general maintenance of the garden and outdoor furniture. The access to the beach via the back gate was a real bonus and the short walk to the nearby shops, became a lovely morning routine to pick up the papers. We definitely enjoyed every minute of our stay and would certainly reconsider renting this house again. The location of this property is fantastic, with a track leading to the beach from the back. It's also particularly good for dogs - fully enclosed yard with lots to explore. The deck was great to relax on when the sun was out. I think that the property could do with a bit of a design overhaul. The main couch is rather uncomfortable/impractical and there's a lot of furniture in the living room that I don't think is required. Also - no toaster? There was a strong smell of moth balls in the main living space that was quite off-putting. A final comment would be to clearly mention in the advertisement what people need to bring (we didn't see any information about this). We weren't aware that towels were required, but thankfully had one in the back of the car. With a few improvements, this accommodation could be even better and reach its full potential. We loved our weekend away at Beach House 65 in October. The best feature is the easy walk to the beach straight out the back gate. The house is well kept and comfortable and a great place for children to run around and enjoy themselves. We recommend it and will certainly be back. We had a very enjoyable stay at Beach House 65 in Venus Bay. The house is close to the beautiful beach, just walk along an easy track from the back of the house. It's was great to have the two separate living areas so everyone had space to themselves and could spend time together as well. We loved all the gardens around the house and were so happy we could bring our dog with us, so nice to stay in a lovely property that is dog-friendly. The whole weekend was bliss, we'll definitely book again! The only good thing about this place is the location. Everything else is a disappointment. I don't normally write review, but after seeing only good reviews, which has led me to book this place last summer, i don't want someone else making the same mistake. I'm not sure why there are good reviews, when the guess book has pages of disgusted comments dated years back?! We stayed in Jan 2016 with 3 couples and 4 young children (aged less than 7). These 3 "pods" are connected only by the deck as pictured.. uncovered, so when is raining, is a pain to get from one to the other. To lock/unlock the doors is by key only. We were given ONE set of key! The children sleeping pod is the first one by the gate, with the "living" pod far end of the house. When the children went to bed early, we have to either lock them in or leave their door unlocked and we had to take turn on checking on them...sometimes, by walking in the rain! Also, there are 2 sleeping pods, as such, the last one that goes to sleep gets the key and the other one sleep unlocked. The kitchen.... not sure where to begin. Is dirty and utensils are so dirty that they might as well being picked up from a dump! With no dishwasher, first thing we did was sort out what can be used (ie. not rusted or broken or too much of irremovable food stuck on) and hand washed them all. We bumped into a family at the beach, and when they found out where we're staying they asked if the rusted fry pan with the broken handle is still there, sadly the answer was "yes". They rented there 2 years ago!! We paid over $400 a night.. the most expensive place we ever paid in Venus Bay (we go there at least once a year, for the past 5 years). Is unfair to get that kind of money and not provide the very basics. We've just booked in another place for this summer at Venus Bay, i can't help but feeling abit resentful when i see this place listed. WOW.... What an amazing Beach 'Shack' !!! Private, Modern, fully equipped and the close to the beach, those were the criteria my partner and I wanted in a holiday rental, needless to say, Beach House 65 didn’t disappoint, in fact exceeded our expectations From our initial enquiries with the owners right up until our departure we felt our every desire was met willingly and happily. The property itself was fantastic; actually the closest house on the street to the beach! The walking track to the beach felt like it was made just for us. The layout of the two separate living and sleeping ‘pods’ was exactly what we needed…. kids to bed…. adults to unwind!! Our stay at Beach House 65 has created some wonderful memories for us as a family and we have already booked for the same time next year!! Thank you Beach House 65.